At least that&apos;s how its feels. 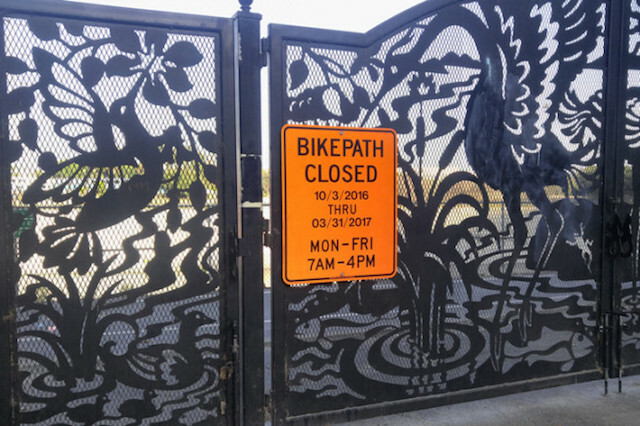 As of Thursday, the Los Angeles River bike path in Elysian Valley is, once again, closed, this time for what appears to be several more months, according to CiclaValley. Mr. CiclaValley posted the above image to his site early Thursday morning, eliciting an enormous amount outrage among the legions of people for whom the L.A River bicycle is a crucial part of regular commuting or recreation. And rightfully so. Closing the path is outrageous. Not only was there never any notification posted on the path itself, the Army Corps of Engineers (the technical owners of the path), apparently made little effort to notify anyone in L.A. city government of the closure either. Neither the L.A. Department of Transportation, the Mayor&apos;s Office, nor Councilmember O&apos;Farrell&apos;s office had a solid explanation as to why the path was closed. While a representative of the Army Corps of Engineers explained to LAist that LADOT and the Army Corps of Engineers had collaborated to plan detours and proper notification for cyclists and pedestrians on the path of the closure, those plans never manifested—in the words of the representative, the Army Corps "really missed the boat on this one." Councilmember O&apos;Farrell&apos;s office was able to share that the path was shut down because the Army Corps of Engineers is removing non-native vegetation along the path, but COME ON. Does that really necessitate shutting down the path from 7 a.m. until 4 p.m. every week day between now and April 2017? Apparently it does. Speaking with T. Jay Fields of the Army Corps of Engineers, LAist has confirmed that the path will be closed for the removal of non-native vegetation from the river (a concrete channel). To do so, the Army Corps will need to park heavy machinery and trucks along the bicycle path, and will temporarily store vegetation removed from the river on the path before it&apos;s carted away. Bikes and backhoes, obviously, don&apos;t mix. Though the path is ostensibly for bikes and pedestrians, the path is technically a utility road that the Army Corps uses to maintain the the L.A. River&apos;s infrastructure. An agreement between the City of Los Angeles and the Army Corps allows the city to operate a pedestrian and bike path on the road, but ultimately the Army Corps can do what it wants with the road. What makes this particularly infuriating is that this is the second time in 2016 that the path has been shut down without any warning. The first was back in January, when $3.1 million of federal money magically appeared to install temporary barriers along the L.A. River (on top of the bike path) to protect neighborhoods in Los Angeles and Glendale from the wrath of El Niño. El Niño never materialized, but the path remained closed until goddamned June. The trouble with closing the path is that it forces people who typically ride on the path back onto streets with poor bicycle infrastructure. Riverside Drive, the detour route that&apos;s most likely to be used in place of the bike path, is extraordinarily poorly paved. While bumpy pavement is uncomfortable for motorists, cracks and potholes can easily catch a narrow bike tire, and cause the rider to fall. Riverside Drive also lacks a bike lane in most places, prompting the age-old conflict between cyclists and motorists who attempt to share the road. Anyway, if the imposition of an un-announced months long closure of a vital commuting and recreational bicycle route annoys you as much as it does me, the best thing you can do is bother your local representatives and the Army Corps as much as possible. On November 7, the Army Corps of Engineers will be holding a public meeting in Griffith Park to discuss their plans for the L.A. River. Please turn out. Like Mr. CiclaValley says, when cyclists come out in great numbers, our government actually takes us seriously.